There has been talk about this little shop in crystal mall for sometime. I never bother because the "crepe" out there are all sale $5 for a flap of undercooked dough with over kill of whip cream. Apparently the crepe like morsel I am to enjoy is a waffle? 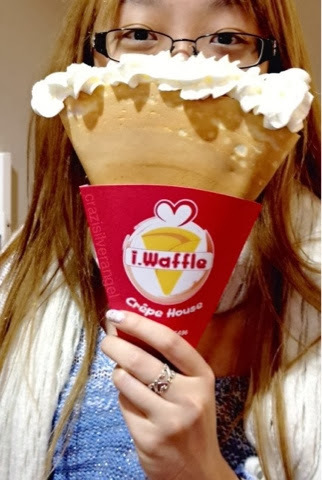 It's very nice, maybe they're using a waffle batter instead? On a hot plate? Resulting in a more cookie like crepe? Who knows! But it's really good!